Etaples is a town about 27 kilometres south of Boulogne. Etaples Military Cemetery is to the north of the town, on the west side of the road to Boulogne. During the First World War, the area around Etaples was the scene of immense concentrations of Commonwealth reinforcement camps and hospitals. It was remote from attack, except from aircraft, and accessible by railway from both the northern or the southern battlefields. In 1917, 100,000 troops were camped among the sand dunes and the hospitals, which included eleven general, one stationary, four Red Cross hospitals and a convalescent depot, could deal with 22,000 wounded or sick. In September 1919, ten months after the Armistice, three hospitals and the Q.M.A.A.C. convalescent depot remained. The cemetery contains 10,769 Commonwealth burials of the First World War, the earliest dating from May 1915. 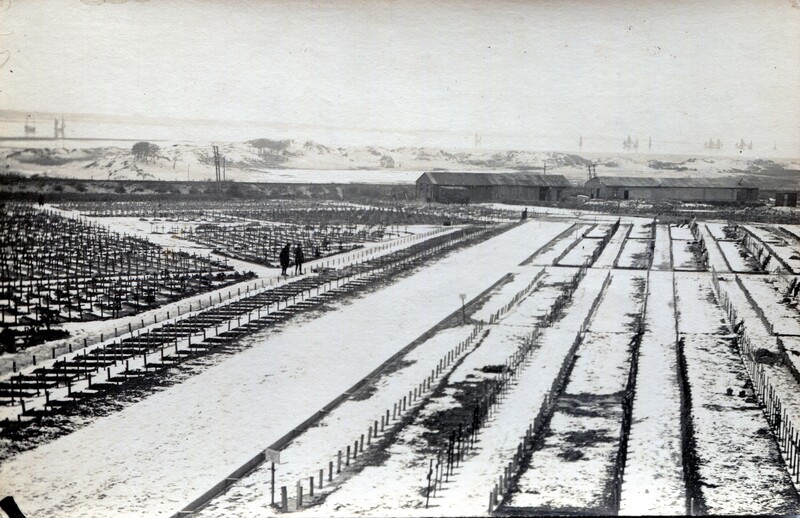 Hospitals were again stationed at Etaples during the Second World War and the cemetery was used for burials from January 1940 until the evacuation at the end of May 1940. After the war, a number of graves were brought into the cemetery from other French burial grounds. Of the 119 Second World War burials, 38 are unidentified. Etaples Military Cemetery also contains 658 German burials and a few war graves of other nationalities. The cemetery, the largest Commission cemetery in France, was designed by Sir Edwin Lutyens.